On July 8, 2018, Mr. Lawrence Aulotte of Fishing Lake passed away at the age of 81 years. He is survived by his loving wife of 50 years, Joan; 9 children, Annette (Duke) Green, Travis (Jen) Daniels, Wayne (Denise) Daniels, Nina (Jason) Quinney, Lawrence Jr. Daniels (mother of his children, Leslie Callioux), Adam McGee, Ernie Aulotte, Joanne Aulotte & Cameron Aulotte; 24 grandchildren; 14 great-grandchildren; brother, Bob Aulotte; sister, Rose Durocher; numerous nieces & nephews; friends & family of Fishing Lake; Stanley & Faithful families of Frog Lake. 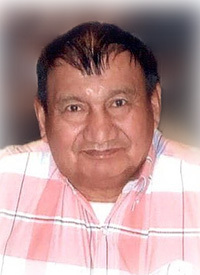 Lawrence was predeceased by his parents, Robert & Philomene Aulotte; 2 daughters, Lorie Desjarlais & Judy Cross; granddaughter, Paige Crevier. A Wake will be held on Thursday, July 12 (leaving Grace Gardens at 2:00 p.m.) at Fishing Lake Communiplex, Fishing Lake, with Final Respects Friday, July 13 at 11:00 a.m. A Funeral Service will be held on Friday, July 13 at 1:00 p.m. at St. Eugene Roman Catholic Church, Fishing Lake. Reverend Father Joji Boyapati will be officiating, with cremation to follow. To send condolences online, please visit www.gracegardensfuneralchapel.com. Condolence and prayers go out to the family, God Bless! Condolences Joan and the Aulotte family. Lawrence my friend your hard work here on earth is done, and now its Harvest time, time to enjoy the fruits of your labour in Heaven with your Family and Creator. Until we meet again, RIP my friend. I am gonna miss our talks and your wisdom. So sorry to hear of Lawrence’s passing. He was a wonderful fellow and a pleasure to visit. My sincere condolences to you and your family Joan. So sorry to hear that Lawrence passed away. He was here not too long ago visiting with Eddie. Our condolences to the family. Procession leaves Grace Gardens at 2:00 p.m. Final Respects will take place at 11:00 a.m. at the Communiplex, with the Funeral Service following at 1:00 p.m. at St. Eugene Roman Catholic Church.